If you say A, you have to say U as well. Unspoiled, unfiltered and outrageously good. Stop a U, as we say. After all, you do not have time to order forever. And what comes to the table when you order "a U"? A very special, yeasty beers specialty with full-bodied-soft-malty character. Pleasantly tart and low in carbon dioxide, it is a beer that is just as good for a snack as it is for a relaxing end to work. Has there a "cult beer" said? Well, we should be right. Oh yes, "a" U, of course you can say. But experience shows that it rarely stays with one. From the 500 ml. bottle with an expiration date of 04-02-19. Sampled on April 14, 2019, so not too far off. Bronze-amber pour underneath a lingering cream colored head. It is unfiltered so there is a bit of fog. Sweet cooked caramel malts are the immediate sensation on the nose and a sort of floral background. Also a slight cellar mustiness. The taste has a sweet malt forward character and a mildly biting floral hop finish that lingers for a moment on the palate. Definitely has that German feel. Many thanks to Snowcrash000 for this beer! A - Hazy amber pour with some yeast particles sunk in the bottom of the glass. S - Toasted caramel malt and earthy spice aroma. T - Balanced straight through with sweet toasted malt up front, some earthy citrus and finishes very balanced. M - Thick and velvety on the palate. O - Very much an underrated beer. Diggin' this beer. Lovely bronze body, slight haziness. Two finger soapy off white head that dissipates to a ring around the glass. The aroma is surprising, a little bready, a little bit of honey. Grainy for sure and floral. The taste is malty, grainy and with a touch of honey sweetness that is balanced out by full but delicate floral hops. Soft, smooth mouth feel. Almost oily. This finish is seltzer-like and is dry as it gets. Cleaner than expected copper orange bier with a thin white foam that recedes leaving only a ring around the edge of the glass. Smells like Germany in a glass... but a mildy tart version. Bready yeast, sweet and toasted caramel, dried floral hops and a faint berry like tartness lingering in the background. Taste follows very closely. If anything, it smells like it would be a tad more tart, but it's actually more sweet. Honey soaked biscuits oozing with wildflower honey. Feels unexpectedly more crisp,dry, and bitter, yes bitter! Superbly easy to drink. A wonderful brew. Not what I was expecting with the tart aspect, and maybe that element is just me, but I like it. It works. This is remarkably drinkable and feels very high quality. I think I'll have another. Prost! Purchased in Bamberg. Taste is roasted grain, and pilsner malt. Light body, high carbonation, sweet. Great summer sipper. I will have to get this again. Very clean. Pours an unclear dark yellow with a thick crown of soft head. Smell is clean, crisp and bready. Some herbal notes and floal hops. Taste is superbly clean and crisp. Smooth bitterness and a bunch of herbal and floral notes circle the terrific crackery malt base. Hints of toffee and leather, and a long finish. Mouthfeel is medium, soft and smooth with sharp carbonation. Overall, just a terrific kellerbier from one of the best German breweries. 330 ml bottle, as mahrsbräu aU, Cardinal Pub & Bar, Stavanger. ABV is 5.2%. Deep golden to amber colour, slightly hazy. Moderate white head. Aroma of malts, and floral and herbal hops. Flavour of malts, yeast with some fruit, and herbal hops. Decent Kellerbier. Pick up a bottle during recent visit to Austin, had never come across it before. Poured from a bottle into a tall hefe glass. Nice initial head and lacing, atop slightly cloudy golden yellow. Grassy smell and taste. A nice earthy bitterness. Enjoyed it and will look for other beers from this brewery. T - toasted biscuit, mild toffee, caramel...a gorgeous, albeit it light malty taste. Noble hops keep things balanced, slightly spicy. O - a super balanced lager. Not too malty, not too hoppy...likely falling on the Zwickel side. Delicious! Pours a cloudy very hazy brownish tinged orange color. Thin off-white head dissipates quickly leaving no residual head. Aroma is a very fragrant array of bread, grain, some yeast, and a hint of citrusy hops. Taste is very bready with some grain and citrusy hops notes. A bit skunky. Slightly bitter hops on the finish have a hint of a citrusy flavor. Some earthy bitterness lingers on the finish. Feel is light to medium bodied. Mild carbonation. Semi-dry finish. I'd love to try this one fresher - while note bad, it does seem suspect that this is an old bottle and with no dates, I have no way of knowing one way or another. That being said, its a solid beer. This keller bier has nice bite to it. The hops bring a fresh character to this. Dark orange/copper in color with not much head to speak of. It’s unfiltered, so it’s pretty hazy.MOuthfeel is a little light for this style, but it’s still pretty good. 500 ml bottle into lager glass, bottled on 5/16/2017. Pours slightly hazy deep golden amber color with a 1 finger dense off white head with great retention, that reduces to a thin cap that lingers. Nice spotty soapy lacing clings down the glass, with a fair amount of streaming carbonation retaining the cap. Aromas of big cracker, bread dough, toasted biscuit, light nuttiness/pepper, and herbal/grassy earthiness. Damn nice aromas with bready malts and light-moderate earthy hop notes; with great strength. Taste of big cracker, bread dough, toasted biscuit, light nuttiness/pepper, and herbal/grassy earthiness. Light herbal, grassy, peppery bitterness on the finish. Lingering notes of cracker, bread dough, toasted biscuit, nuttiness, pepper, and herbal/grassy earthiness on the finish for a while. Incredible complexity and robustness of bready malts and light-moderate earthy hop flavors; with an awesome malt/bitterness balance, and zero cloying/astringent flavors after the finish. Lightly increasing dryness from lingering bitterness. Perfectly clean on lager flavors, with zero yeast notes present. Medium carbonation and body; with a very smooth, creamy/bready/grainy, and fairly sticky balanced mouthfeel that is fantastic. Zero warming alcohol as expected of 5.2%. Overall this is a fantastic kellerbier! 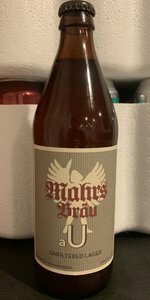 All around outstanding complexity and robustness of bready malts and light-moderate earthy hop flavors; very smooth, clean, and refreshing to drink with the mellowly bitter/drying finish. Amazingly rich and clean Pils/Munich malt flavors, with solid earthy hop presence and balance. A highly enjoyable offering, and spot on style example.